Perfect baking every time—our exclusive marble-finish cake pan combines the stability of metal bakeware with the flexibility, nonstick performance and quick cleanup of silicone. An integrated steel rim gives the pan structure and secure handling, while the highest-quality European silicone cools quickly and lets you pop out your baked creations without the need for utensils. Structure Silicone is dishwasher safe and is resistant to thermal shock, allowing it to transport safely from freezer to oven. Family owned since 1889, Trudeau backs up their bakeware with a lifetime warranty. I got this pan and the large & regular size muffin pans - I love them! I saw the other reviewer put the bundt pan on a baking sheet and had bad results but I think that the baking sheet actually deflected the heat and over cooked the bottom. 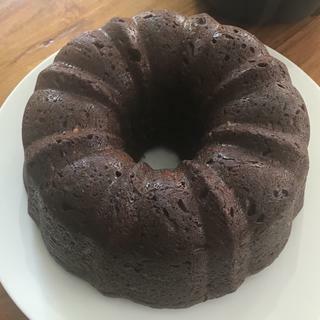 I baked mine directly in the oven and used a recipe I've used a bunch of times with my other metal bundt pan and it turned out awesome. I l love that these are sturdy and hold up nicely when filled, most silicone pans don't do that. I do recommend on all cakes to test with a toothpick or cake tester because some ovens aren't as hot as others and remember that bundt cakes are deeper than most - so I use a wooden skewer. Death by Chocolate Zucchini cake - yum! The first bundt I tried in this pan appeared done, but 1/4 of the batter oozed out when I inverted it (toothpick came out clean). The second time I used the same recipe but cooked it 20 minutes longer, and the cake was done all the way, but the cake fell and was more dense than in a metal pan. I'm looking forward to someone publishing some conversions so I can use my favorite recipes.......It didn't stick after being buttered and the cake turned out beautifully (other than the overbrowned bottom where the silicone rested on a baking pan). Silicone is one of the best options for cakes, provided it is high-heat and European grade. Cakes and other baked products always cook evenly and release with ease. I've been having an issue with my Nordic Bundt cakes pan sticking on one side and was thinking of giving this Bundt cake pan a try? Will it fill a regular recipe it says 10 cups aren't most 12 cups? Will this fill a regular Bundt cake recipe? BEST ANSWER: The instructions on the packaging say to not use spray, but I've coated it thickly with softened butter and had almost no sticking. I'm still figuring out how to adjust the time/temp on mine - the first time the cake was way underdone when cooked for the normal time, and more dense than normal when I did it again same recipe but longer. Going to try increasing the temperature next. I didn't use any spray or butter and had no sticking. I used a regular recipe that I've used on my metal pan - it holds the same amount of batter just fine. Don't use a baking sheet below - you don't need it and it changes the time and result. Hope that helps. Nordic Ware Bundts are also 10 cups so this should fil any regular bundt pan recipe. What are the manufacturer's recommendations for placing directly on the oven racks? BEST ANSWER: The silicone is 100% safe to place directly on oven racks, it is not recommended to use baking pans underneath as it will over cook baked good. The structured silicone allows each pan to be placed directly on oven racks.